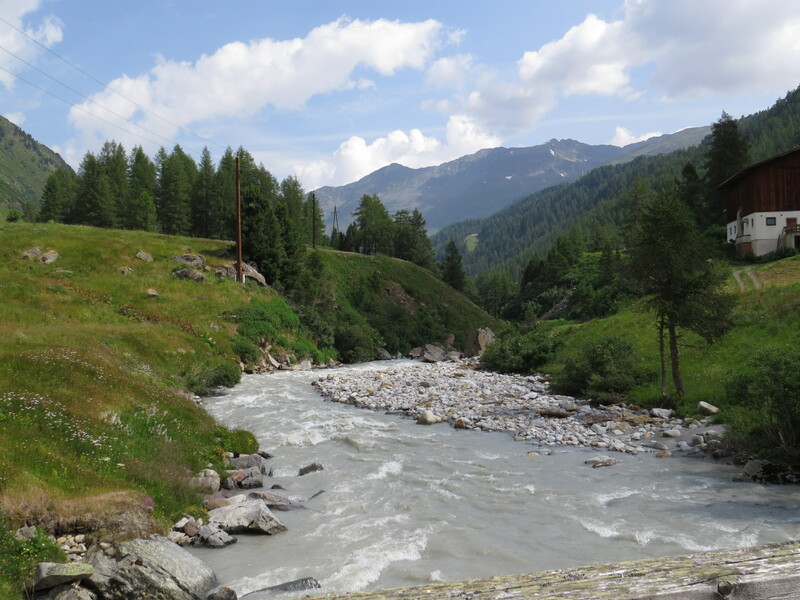 The river Gurgl.How I love an onomatopoeic name! Dear Readers, as you will know if you follow the blog regularly, I spend a fortnight every year in the alpine village of Obergurgl, skipping about like a (middle-aged) mountain goat and eating prodigious quantities of cake to make up for the calories expended. This year, alas, my skipping was halted by a rather unfortunate incident. Under every Tyrolean hotel there is a Boot Room, and as I made my way to the one under the Hotel Wiesenthal on the first day of the holiday, I neglected to notice a tiny step down and crashed dramatically to the ground, twisting my ankle and feeling like an idiot to boot (sorry). Fortunately I was able to spend the rest of the afternoon with my leg raised and my ankle completely wrapped in a bag of ice (courtesy of the Picnic restaurant across the way), and after taking it easy the following day, I was up for a very small adventure. 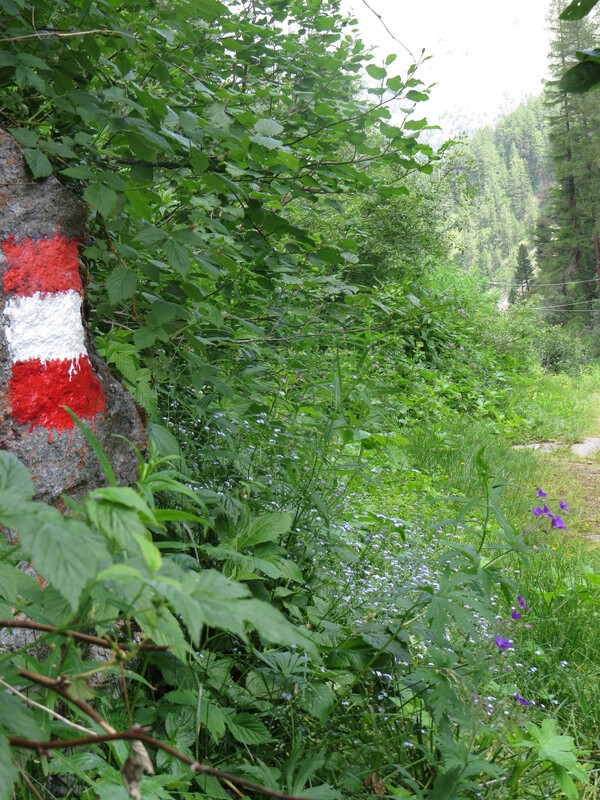 What could be better than a slow amble down to the Sahnesturbel, a mountain hut which serves the best cake in the village? So off we went, climbing slowly up amongst the meadow flowers. Some farmers are already cutting their fields for the first time, so I was glad not to have arrived later in the year. I am always stunned by the sheer variety of flowers, and the concomitant biodiversity – there are butterflies, day-flying moths, beetles and flies of all kinds. 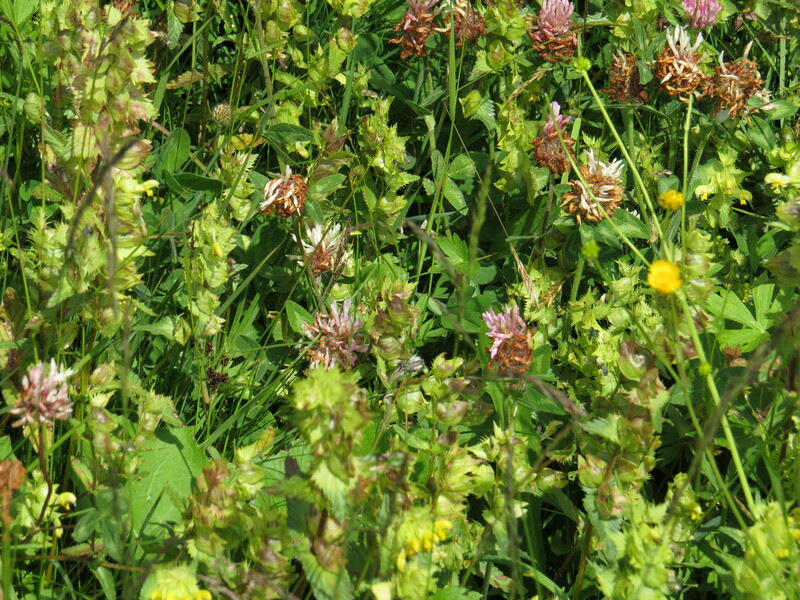 The yellow rattle helps to reduce the fertility of the soil and keep the docks and nettles in check, and the many species of clover and vetch put nitrogen in the soil. 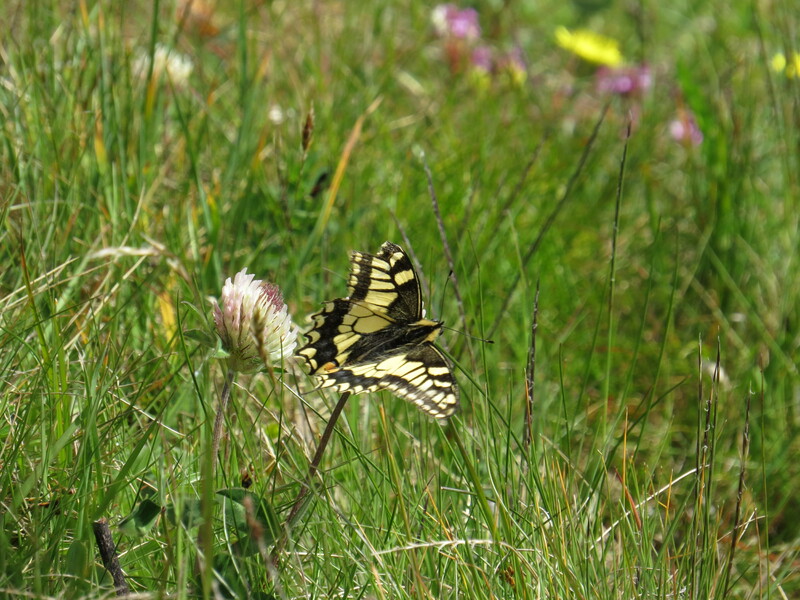 A swallowtail butterfly put in an appearance, feeding on clover. One of its wingtips was missing, perhaps the result of a close encounter with a bird, but its flight was still strong. Several of the larger butterflies that I saw looked a little worn – the summer season is short here in the Alps, and I imagine that many of these insects have already had their share of drama. 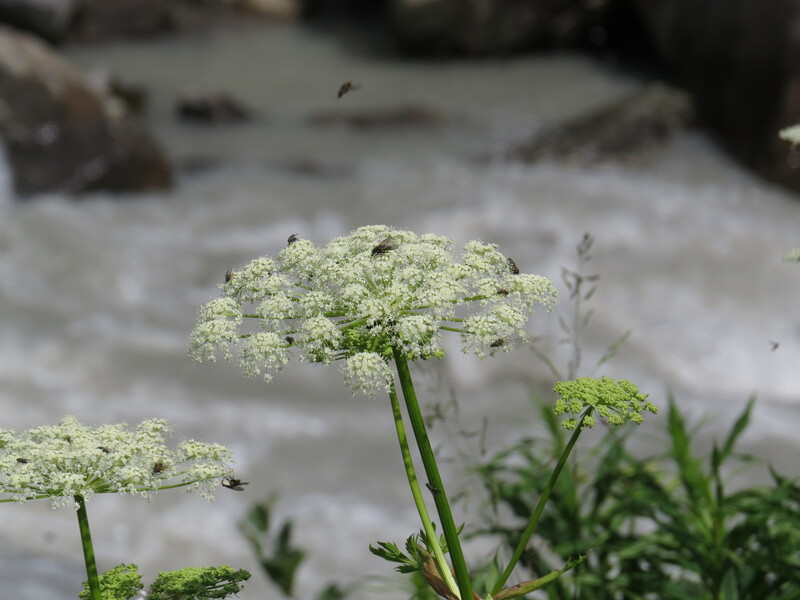 Every time that I come to Obergurgl, it seems that several plant species are doing particularly well. 2018 seems to be the year of the bladder campion (Silene vulgaris)…. and the round-headed rampion (Phyteuma orbiculare). 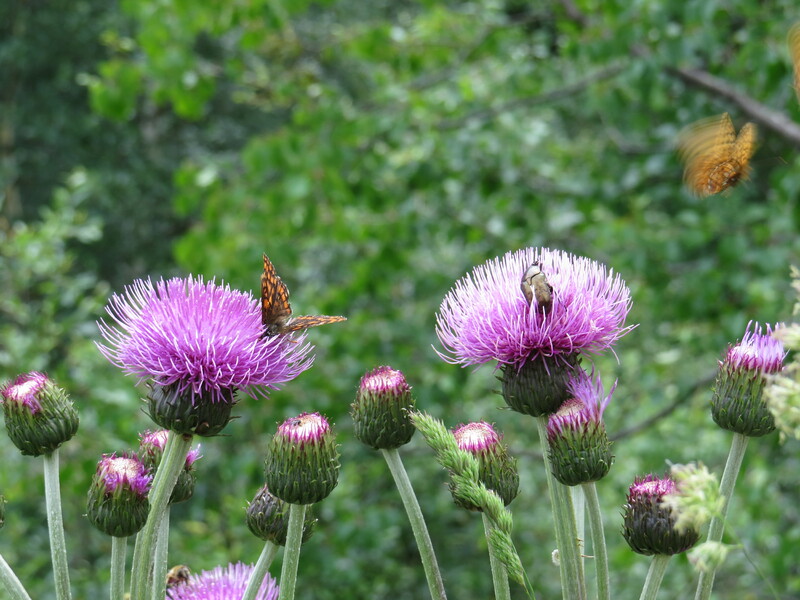 But I confess to really loving the melancholy thistles. 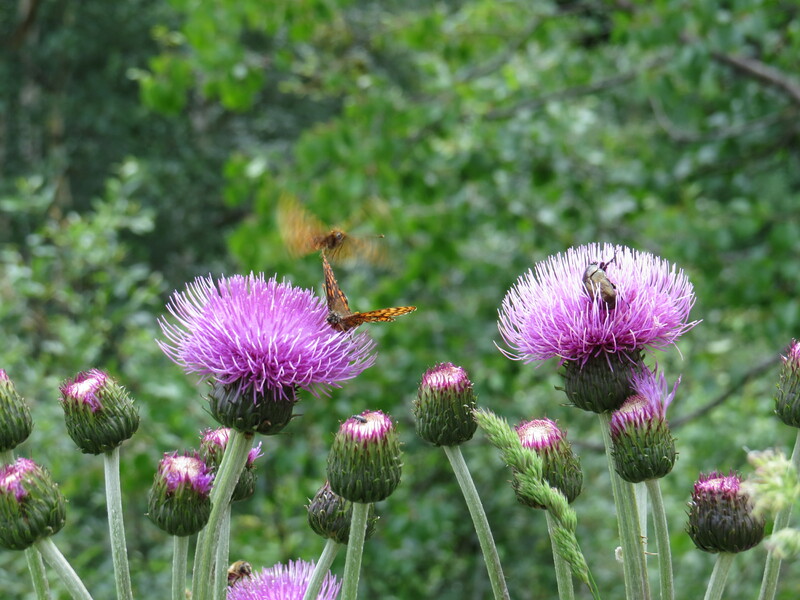 They are so dramatically pink, and such a magnet for insects of all kinds. The bees sometimes seem to collapse into them in a nectar-induced coma, and I can imagine no finer bed for a sleepy insect. Plus, this year was the scene of some drama. I noticed a fritillary feeding from one of the flowers, and for once my camera was handy. A male flew in, attempting to mate with the female. Then he was chased off by another male. All this time the female carried on feeding. Sometimes it’s best to just ignore this kind of shenanigans I guess. It’s easy to forget how territorial butterflies can be – I watched several orange-tips guarding their patch of plants against all comers, including various species of white butterfly who were twice their size. Of course, they could also have been mistaking them for female orange-tips. These idyllic mountain pastures are the scenes of so much drama at the micro level, and as I was moving more slowly than usual I had a chance to really watch what was going on. 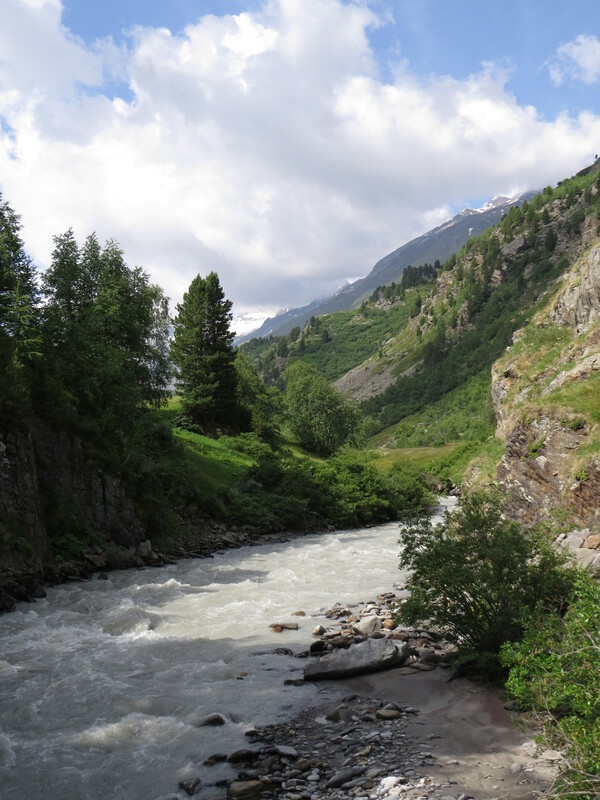 Once we crossed the river again, we had a walk along the river bank, where the flora is completely different. 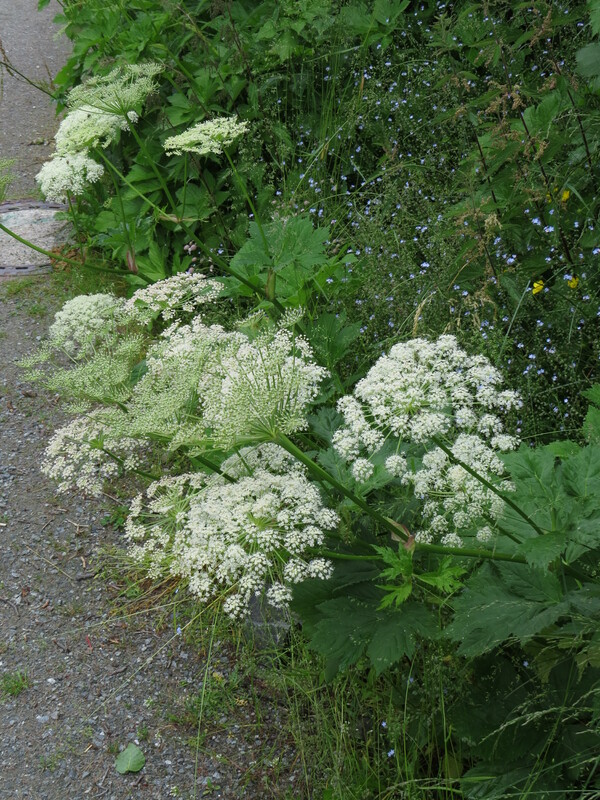 Several species from the Apiaceae or carrot family dominate here, and I love the way that the broad flowers become a huge dinner plate for many species of pollinating flies. Flies get a bad press, but they are important for the fertilisation of many species of plant. Plus, the blooms are very beautiful, especially in these damp, shady places, where they seem to glow and burst like fireworks. We cross the road (carefully, this is prime motorbiking country, and those guys are often travelling very fast) and head up into the pine forest. We manoeuvre round some lively calves, and their many and varied cowpats, and then we’re into the woods. 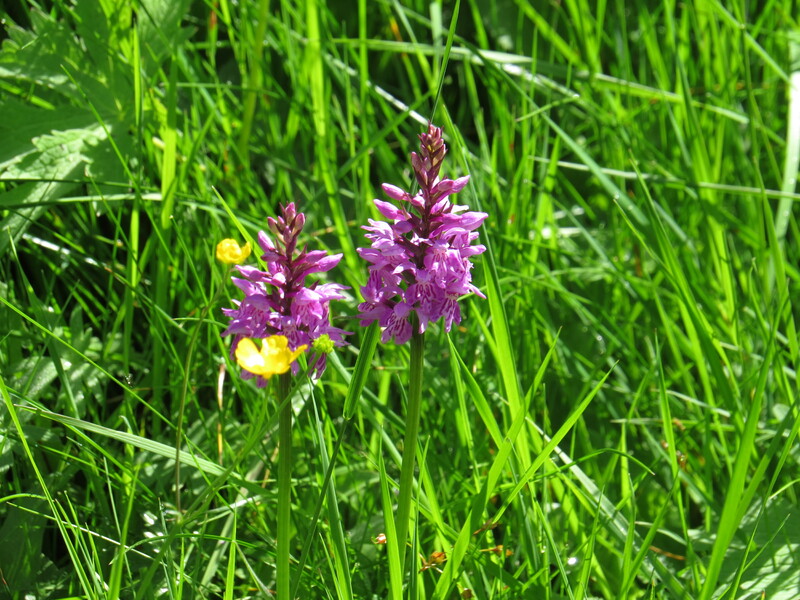 This has been a good year for the broad-leaved marsh orchids – the central reservations of the roads are full of them, and the woodland paths are lined with their pink-speckled flowers. 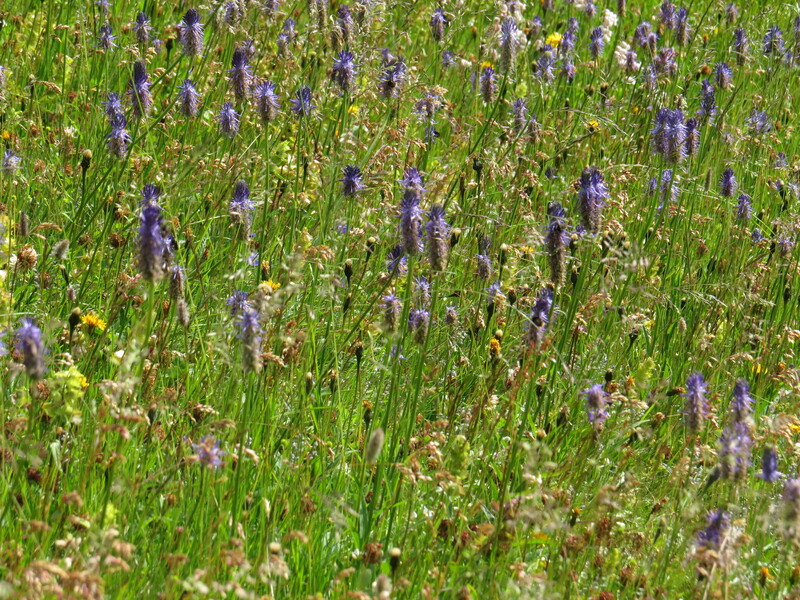 These plants prefer poor-quality, wet soils, and they are profuse in the boggier areas of the region. 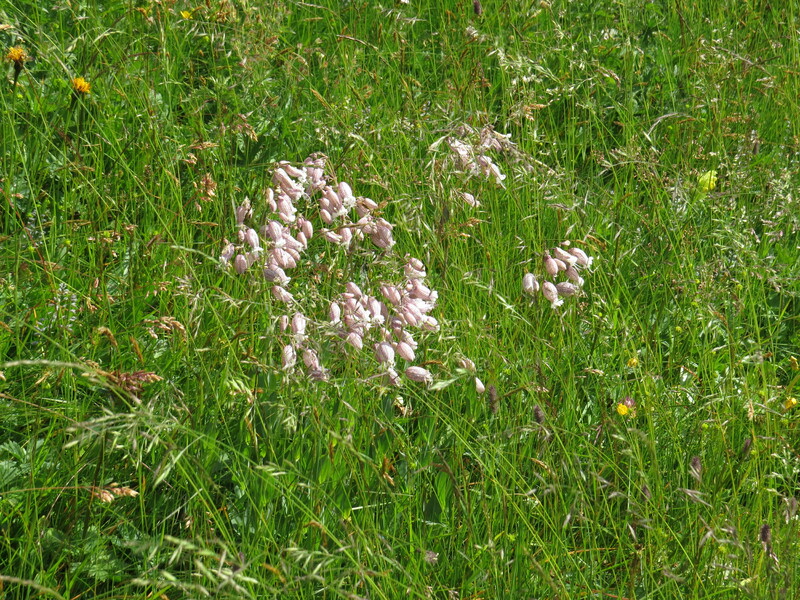 They are, however, not quite as sensitive to the soil conditions as some orchids, and so are usually the last to be lost when a meadow is drained, or when nitrogen run-off from farms becomes a problem. 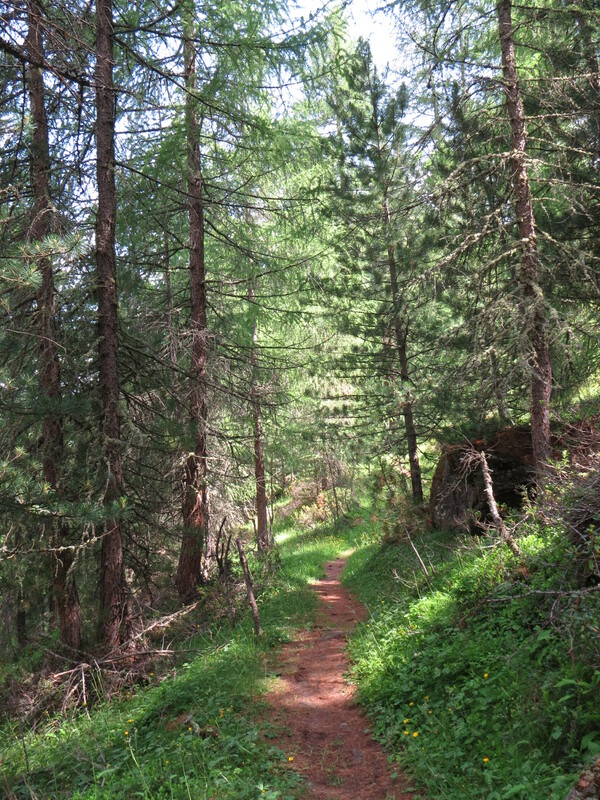 Long may they, and their rarer relatives, survive here in the Tyrol, one of the last places where they are common. 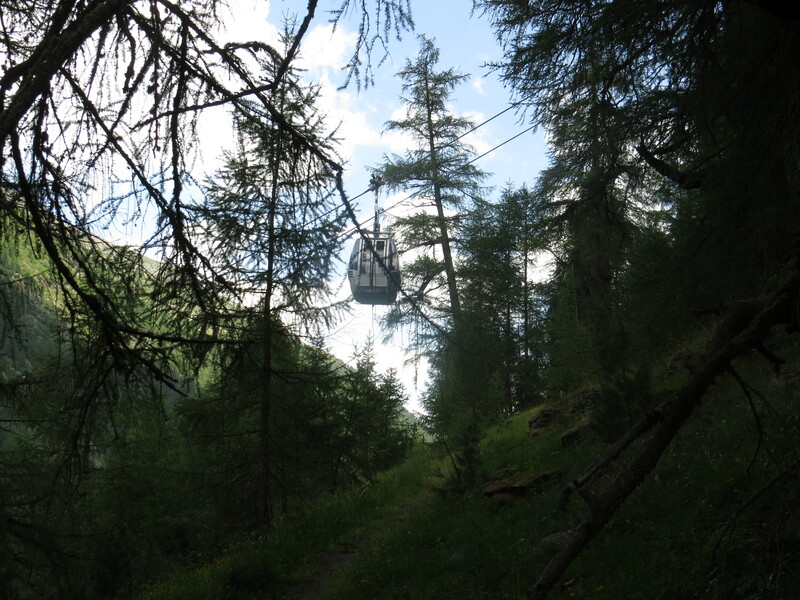 The gondolas from the Hochgurgl lift glide silently overhead. It’s rather surreal. 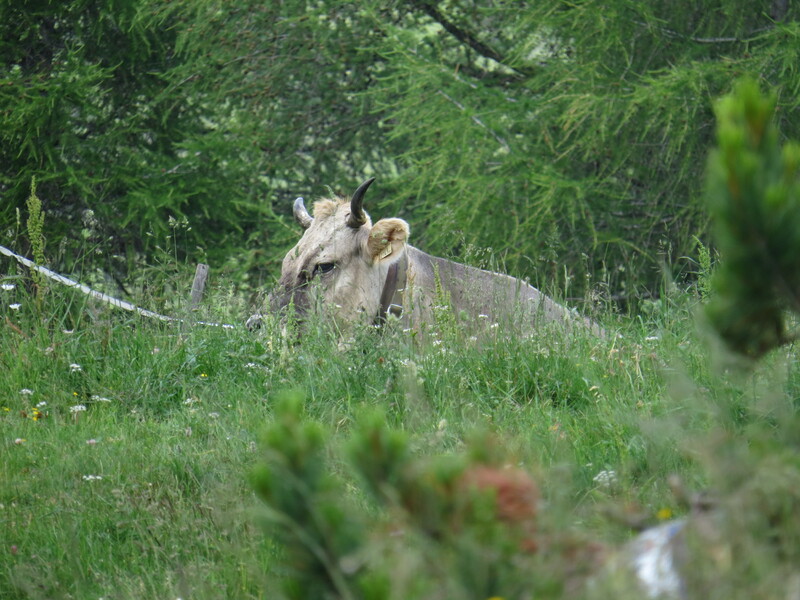 One of the Tyrolean grey cows gives us a look as we advance, but can’t be bothered to move, and who can blame her? We scoot round her respectfully. 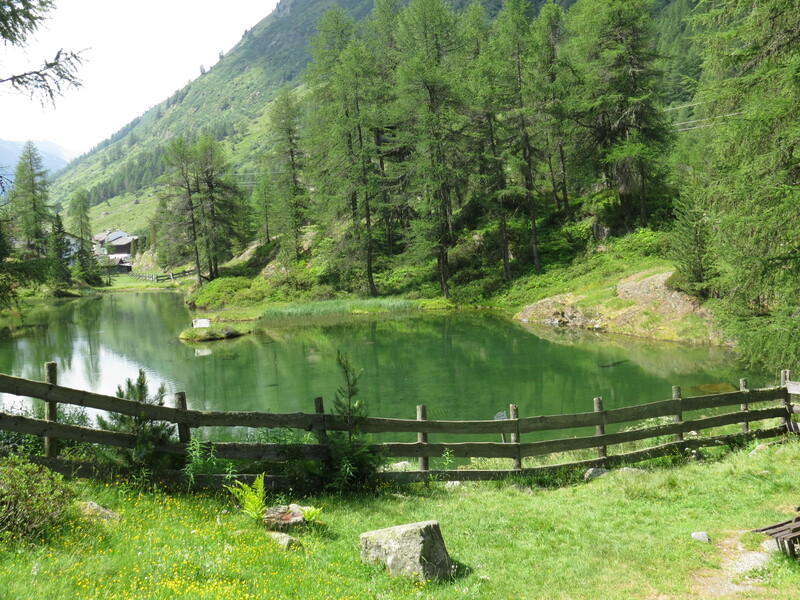 We pass by the Piller See, a little pond stocked with trout, at some speed – a few years back we stopped to eat our sandwiches. It wasn’t until I got home that I realised that every midge and mosquito in the area had fed on me while I was eating my cheese roll. My husband didn’t have a single bite. Go figure. Then it’s down to the river again, which has picked up pace by now and is whooshing past with some vigour. In the end, this water will join the river Inn ( for which Innsbruck is named) and will eventually become part of the Danube. This is a most ambitious little stream. 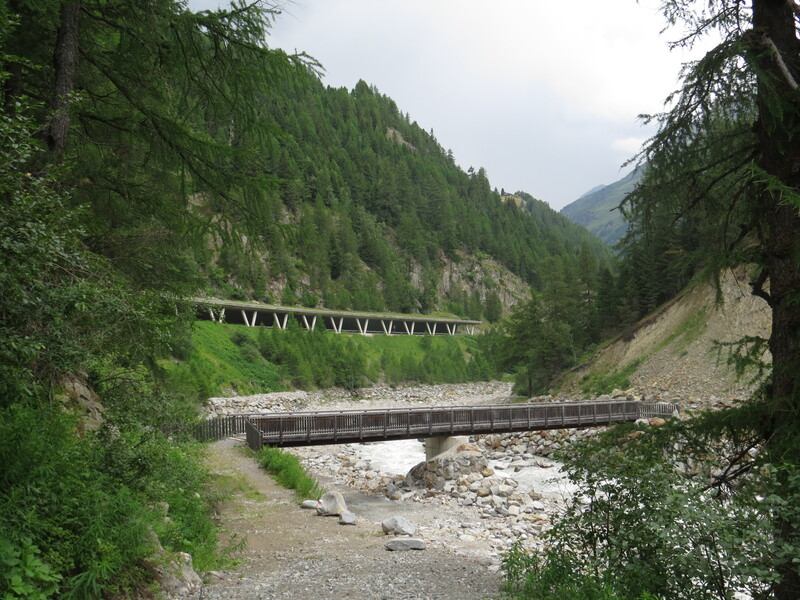 We cross one of those see-through metal bridges that the Austrians (who obviously have no fear of heights) are so fond of, and plonk down on a bench to sort out our socks and boots and have some Toblerone. By now, however, the clouds are starting to set in, and my ankle is starting to twinge. Just as well we’re on the home straight. We cross the bridge. Landslides are common here, and rocks that vary in size from house-sized boulders to pebbles have been washed down by the glacial waters. I pick my way gingerly along the riverside, and then up through the woods for the last time. I can see the flag of the Sahnestuberl through the trees. And then, at last, just as the rain comes on in earnest, we’re there. The Sahnestuberl is one of the last old-fashioned huts in the valley, with a mish-mash of deckchairs and wobbly tables and umbrellas outside. 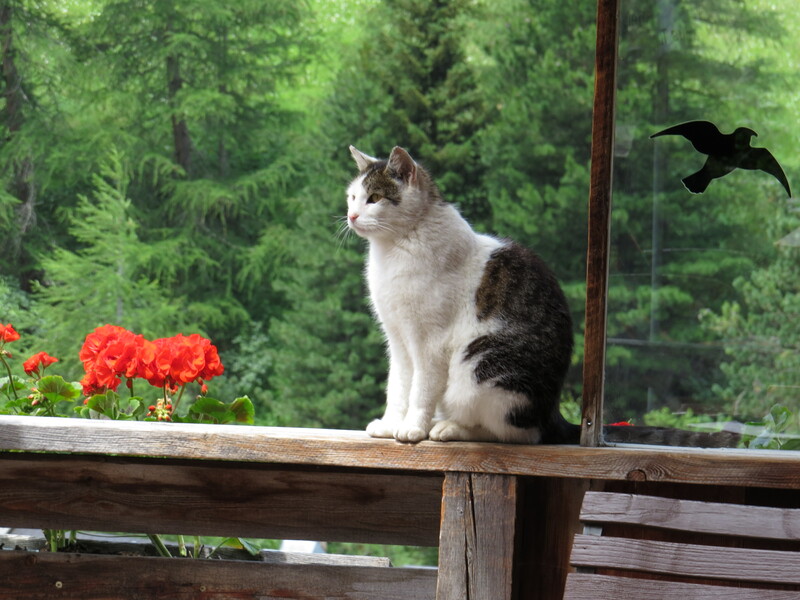 But the owners are friendly, the food is good and wholesome, and the cat is still here. He is clearly in charge, as you can see. There is only one home-made cake every day, so you take your pick. But today it’s apricot, my favourite. We were going to share a piece in the interest of our waistlines, but really, life’s too short to share a cake. So here it is. I’m sure it’s helped to cure my ankle. This entry was posted in Bugwoman on Location on July 7, 2018 by Bug Woman. I hope that your ankle is ok now. Lovely to see all those meadows. Interestingly, on the news today they were reporting how we have lost most of our meadows in the UK. I have some puple orchids growing in the hospice grounds (and in my lawn at home). 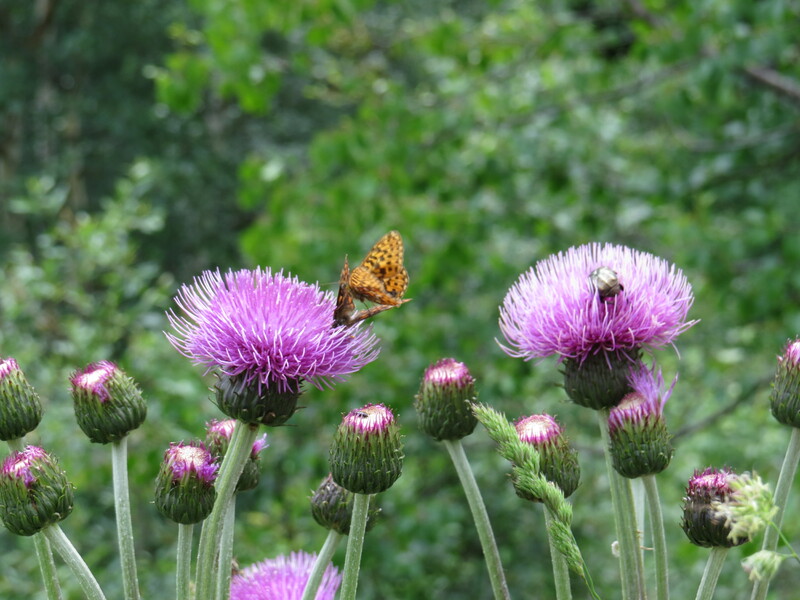 Yep, we’ve lost 97% of our meadows in the UK. Mark Cocker’s new book ‘Our Place’ is very interesting on the history of conservation in the UK, and the ways in which it has triumphed and failed. How lovely to have purple orchids! Terrific photos! I approve of the female fritillery totally ignoring the males and getting on with her dinner. Don’t overdo it on that ankle, and remember the pain killing properties of alcohol! After all that . 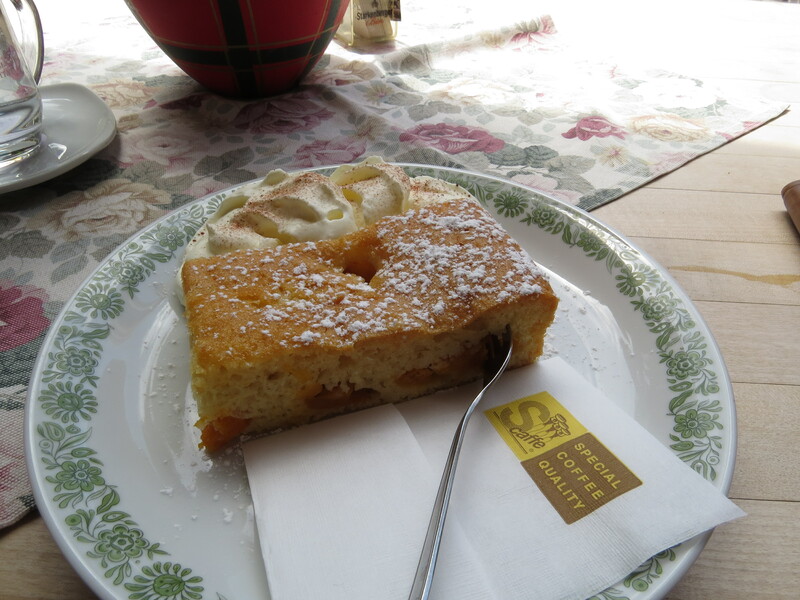 . . apricot cake . . . in Austria!? I suppose apricots grow nearby in Italy too. Yep, the Austrians make apricot strudel and apricot dumplings too.